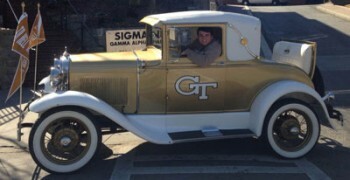 It is an honor like none other at Georgia Tech — to be chosen as the driver for the legendary Ramblin’ Reck. A story that dates back to 1914 — only 18 years after the founding of our Gamma Alpha Chapter, the tradition of the Reck is one that we can celebrate more than ever this year as one of our own has been selected as the 2015 driver. Hats off to Brother Jake Meisner ’16, a junior chemical engineering major, who was elected by the Ramblin’ Reck Club to serve as this year’s driver. Read below to learn more about Jake. How were you selected as this year’s driver? I was selected as this year's driver through the Ramblin' Reck Club's election process. I gave a speech before the entire club; I answered questions ranging from my list of commitments for 2015 to what plan I had in place if the Reck were to break down on a game day. Thankfully, the club selected me as driver. What has this responsibility and honor meant for you so far this year? This is a huge honor for me. I have tremendous respect for all the past drivers that I have had the pleasure of meeting. To now be one of them is an honor in itself. I will always cherish the support of all the great people that make Reck Club the best student organization on campus. Georgia Tech is an institution with traditions that can be seen in every-day interactions, and to be the sole keeper of its most cherished tradition is something that I will never forget. 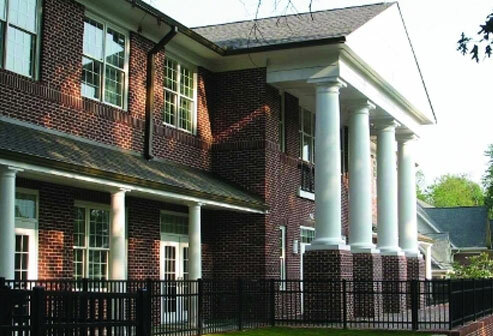 How do you think you can best represent Sigma Nu in this capacity? I plan to govern all my acts with a high sense of honor and to make the Sigma Nu fraternity proud to have me as a brother. Tell us about your hometown, major, family. I am from Canton, Ga. It is a relatively small town that seems to keep growing. I remember, as a kid, that it took 20 minute to drive to the closest grocery store in Alpharetta. Today, my old house is within walking distance to a Publix and a Kroger on the same street. I grew up in a house of five. My mother, Cynthia, is a labor and delivery nurse and has worked for Northside Hospital for the better part of three decades. My father, George, is an electrician. He has worked for AT&T for more than 30 years. I have two brothers; Shaffer is 16, and Will is 14. My family as a whole has raised me to be the person I am today. What inspired you to pledge Sigma Nu? I decided to join Sigma Nu because I was drawn to the diverse group of young men that I had encountered. At other fraternities I rushed, there always seemed to be a single unifying factor that defined the fraternity, and I thought that was a good thing until I came to Sigma Nu where honor is the unifying factor. That interested me the most. Have you held any officer position within the chapter? I was an IFC representative for the spring of 2014. Are you involved in any other campus activities? If yes, what? I am on the Student Center Expansion Committee; we hope to one day house the Reck at the Student Center. What is something that not many know about you? Not many people know that I learned how to drive a stick on a tractor when I was 10 years old.